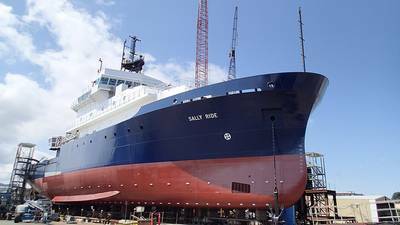 Named for the first American woman launched into space aboard the Space Shuttle Challenger, the Research Vessel Sally Ride was commissioned August 9 at Dakota Creek Industries (Anacortes, Washington). Sally Ride is a U.S. Navy Office of Naval Research sponsored Auxiliary General Oceanographic Research Vessel (AGOR-28). The vessel’s advanced deck machinery will be operated by Scripps Institution of Oceanography personnel during extended scientific missions upon the seven seas. Missions to explore and study the hostile ocean environment implore low maintenance deck machinery designs for rugged durability. The Sally Ride is outfitted with two Electric Hydrographic Winches, an Electric Anchor Windlass and a Trawl/Tow Traction Winch System, all of Markey Machinery Company, Inc. (Seattle, Washington) design. The hydrographic winches are Markey’s new high performance type CAST-6-125 with active heave compensation controls. These deep sea research winches include a proven motor-powered level wind with pushbutton pitch adjustment for new cable diameters. The shipboard cable pathway leads to articulated launch and recovery cranes for over the side load handling of samplers and instruments. The rotating elements of these modern hydrographic winches minimize rotating mass, maximizing winch responsiveness, and reducing stress on cables and equipment. When this automatic control mode is engaged the drive’s integral processor evaluates heave data, outputting counteracting speed/direction signals to control the drum and effectively eliminate 90% of the ship’s motion up to sea state 4 (moderate sea state) conditions. The winches drum carry up to 10,000 meters of 0.393 inch diameter fiber optic cable. The 125 horsepower motor produces cable pulls of 19, 825 lbs. at bare drum and 10,000 lbs. at full drum. The CAST-6 drums can easily be unbolted and swapped in as little as one hour to keep pace with ever changing research technology. Sally Ride’s Trawl/Tow Traction Winch System is the all-electric Markey type DETW-9/11-48 supporting coring, trawling, towing, dredging, ROV, and other scientific operations. The system integrates the DETW-9/11-48 Electric Traction Winch, a DESR-11-48, and a DESR-9-30 Electric Storage Reels with local and remote controls and digital all-electric AC- variable frequency drives. The dual drum traction winch acts like a powered capstan multiplying the low tension tailing force of the storage reels. The two grooved dual drums of the traction winch, level wind turning sheaves and storage drum core diameters all are sized for a minimum bend diameter ratio of 40:1; thus the system is suited to, designed for, and proven operationally affective spooling 0.681 inch diameter fiber optic cable on AGOR-23 class vessels. Assuring long cable life on the high tension (working) side of the traction machine, the Sally Ride’s cable path is absent reverse bends. The Markey Traction Winch system utilizes a sheave-mounted load pin arrangement on the storage drum level wind. The continuous “low tension” output signal closes the torque control loop allowing the drive to maintain accurate constant cable tension and thus even, smooth spooling throughout the entire storage drum capacity. The amount of back tension is easily programmable by the operator and eliminates need for slack line preventers. 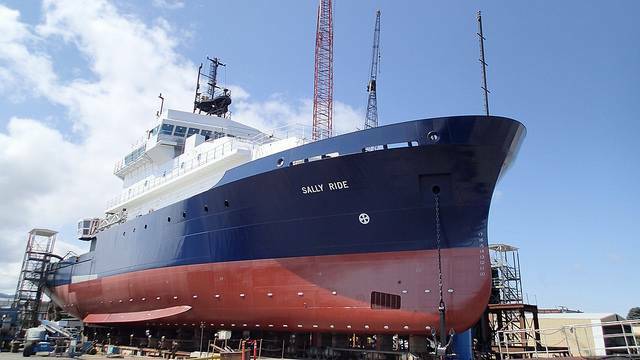 The Sally Ride is scheduled to sail loaded with39,370 ft. of 9/16” 3x19 torque-resistant wire and 32,808 ft. of 0.680 inch electricalmechanical cable or 0.681 inch fiber optic cable. Each traction wheel is powered via a single 75 HP electric motor for 150 HP total performance and the storage reels are powered by single 30 HP electric motor. The system is rated to pull 26,500 lbs. at 205 ft. /min and light line pull of 16,500 lbs. at 300ft/min. Finally, but certainly as important, the Sally Ride uses a Markey type WES-23 two wildcat electric anchor windlass to handle 1-7/16” grade 3 anchor chain. Designed for bolt-down installation, each wildcat on the WES-23 is fitted with a band-type brake, a jaw-type disconnect clutch and two 18” diameter warping heads at each end of the horizontal main shaft. The WES-23 is driven by a 30HP, NEMA-D marine motor that is rated for 30-minutes of continuous duty and fitted with a marine-duty spring-set / electric-release automatic disc-brake. The windlass is certified to meet ABS requirements equivalent to a single chain-pull of 14,200 lbs. at 30 ft. /minute and an overload capacity to 21,300 lbs. An American astronaut, physicist, author and hero who embodied the tradition of exploration, Sally Ride’s spirit lives on in the newly built research vessel that bears her name. Providing the most reliable scientific deck machinery in the world, Markey is proud to be provider of this vessel’s mission-critical deck machinery. Markey’s 107 year history of developing pioneering machinery is the perfect accompaniment to the spirit Sally Ride brings to exploring inner space.